Although we can benefit from classic literature, none of the works in the Western canon of classic books should be read uncritically. This work explains how to read books thoughtfully, helping readers understand how they may find the author’s message and know how to read different kinds of literary works. How to Read a Book, originally published in 1940, has become a rare phenomenon. 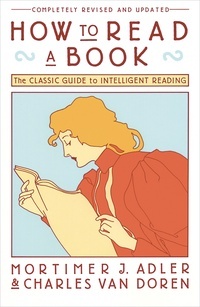 It is the best and most successful guide to reading comprehension for the general reader. You are told about the various levels of reading and how to achieve them — from elementary reading, through systematic skimming and inspectional reading, to speed reading, you learn how to pigeonhole a book, X-ray it, extract the author’s message, criticize. You are taught the different reading techniques for reading practical books, imaginative literature, plays, poetry, history, science and mathematics, philosophy and social science.